More from the 1809 Hedge House in Plymouth, MA. Among the 1809 Hedge House's many interesting objects are two doll houses. 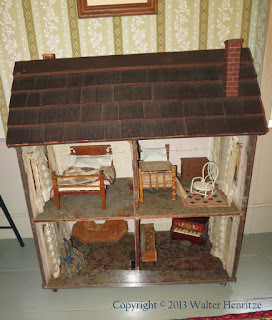 A relatively intact doll house helps us get an idea of the way a home was furnished and decorated. The actual house, on the other hand, having undergone numerous changes over the years, demands quite a bit of historical detective work to restore it to the way it looked during a given era. 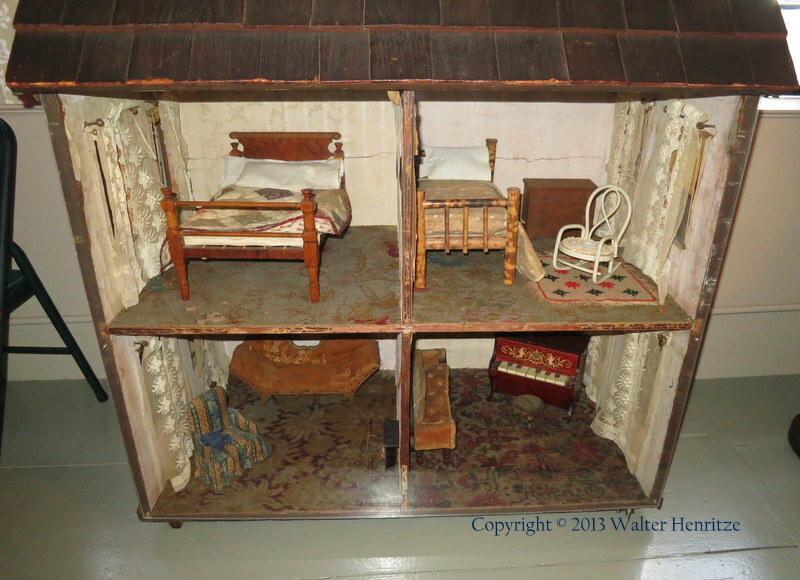 I'm not sure there were any descriptive placards for these doll houses. If there were, we failed to get pictures of them, and so I'm going to have to use my best guess, and invite audience participation. 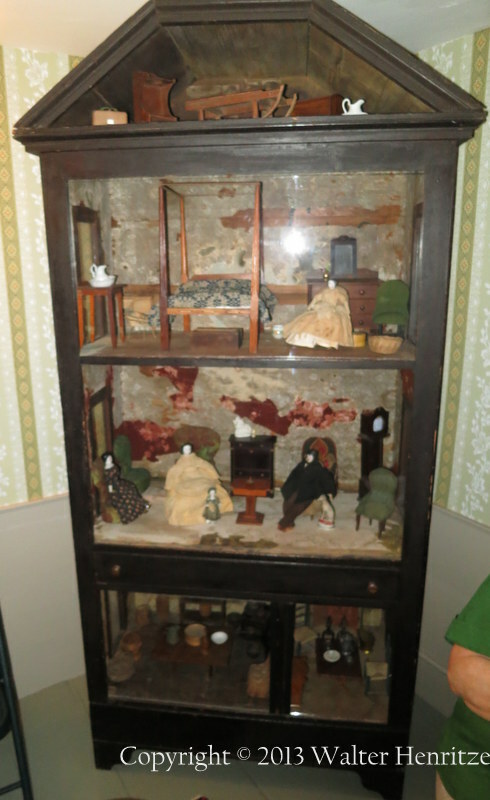 The one with the dolls seems to be Victorian, given the doll's clothing. Though the floor and wall coverings are badly damaged, it has several charming pieces, like the dog. It's also retained its tiny cookware and dishes. 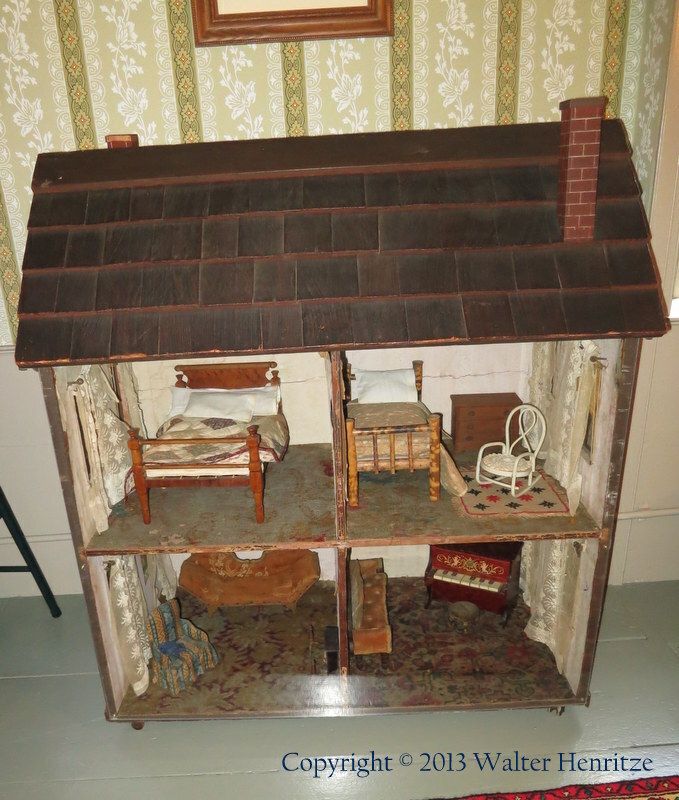 The one without dolls may be Victorian, too, given the floor coverings and the style of the love seat and sofa. 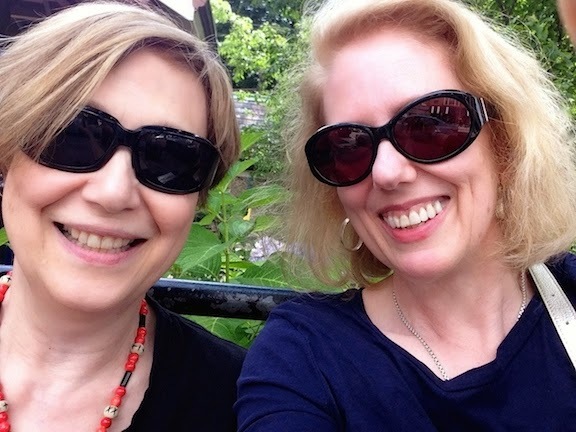 You'll note that the beds do not have box springs, or the sort of mattress familiar to us. Under the mattress are rope supports. If any of you has ever slept on this kind of bed, I think we'd all like to know how comfortable it is or isn't. Thanks for this pictures of the dollhouses, Loretta. Did you get a sense from how they were displayed whether they were intended as toys for children or something produced for adults? Jackie, I just got additional, very interesting info directly from the Plymouth Antiquarian Society, and will post it next week. In the meantime: Yes, these were for children. Rope beds- depending on the mattresses used- remind me a bit of hammocks or canvass camp cots (tho without the risk of randomly falling over!). I had only an under-stuffed corn husk tick and I have to say, it was amusing for one night but I don't think I'd like it long-term. "I have slept on a rope bed and it is comfortable. It is more the mattress that matters, rather than what is supporting the mattress."